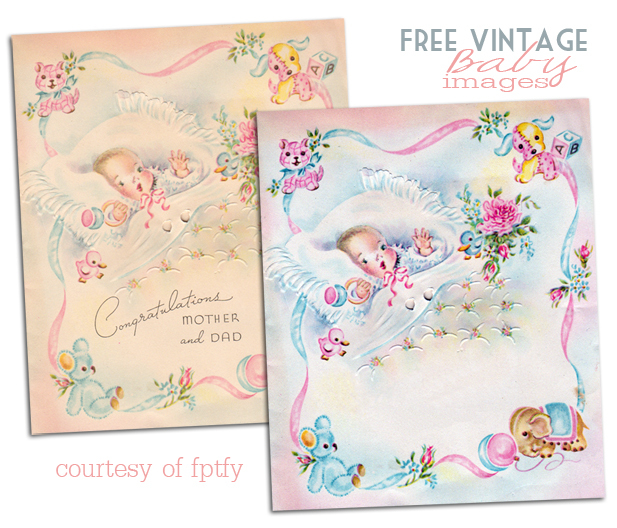 Here are some more gorgeous free vintage baby images that completely melt my heart! They have the sweetest little delicate border with precious vintage toys and flowers. The cute baby is laying on the prettiest ruffled pillow you ever did see. Just imaging your bed with some of those beauties on it– I would never want to get out of it! I went ahead an gave you two versions of this image just in case you wanted the original image without any editing done to it. To tell you the truth ..I can’t decide which one I like best.. Can you? To download just click the image above! Aww, she’s darling! I love the little teddy bear and elephant. I like them both too!! SOOOOOOOOOOOOOOOOOOOOOOOOOOOOOOOOO precious!!!! I simply love this image : ) you always do such an amazing job on all of these vintage treasures! Sending hugs and love to all!